Breakfast is the most important meal of the day, they say. I guess to get your body and soul back to earth. But some days you just need to stay out in space a bit longer. For those kinds of days I get my breakfast at Pastisseria Hofmann. It starts when you open the door and take your first step inside. The aromas of this pastisseria just take you away. Then you choose your pastry. They all look so attractive that it’s almost impossible to just have 1. But to be honest, the normal croissant without any chocolate, mascarpone or whatever other temptation they have, is actually the best. The first bite into the croissant takes you back to the dreamland you had to leave not so long ago. To top it off you can get your coffee to-go at the pastisseria, but you can also go to the cafeteria next door. Just take your freshly baked croissant in a perfect little brown paper bag, which is from the same crispy and crunchy category as the croissant itself, with you. It is in a cultural centre, both are part of the Hofmann School of Hospitality. At this cafeteria you can also get nice sandwiches and cookies. 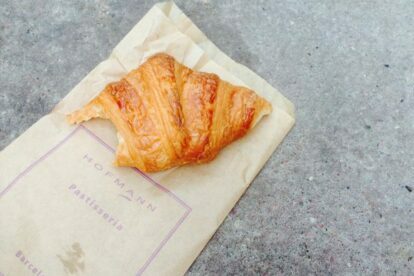 But for me it’s part of my morning ceremony to get my croissant at the pastisseria, walk to the patio with the paper bag in my hand, knowing that in a few seconds I can start the day again with a whole new feeling!